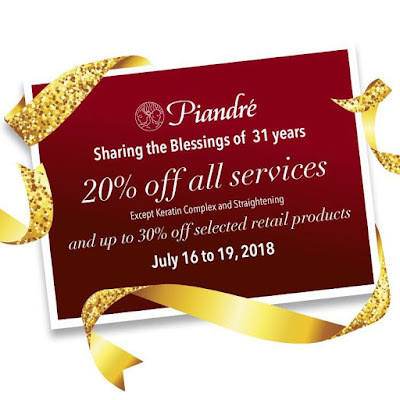 Piandre Salon is celebrating their 31st year this month with a promo! Avail of 20% off all services (except Keratin Complex and Straightening services) from July 16-19, 2018 (Mondays to Thursday). Also, most of their retail products will be ON SALE by as much as 30% off, so it will be a good time to stock up on your favorite home care products!